Picking out the right Spinel has perplexed man for years. From royal jewelry to the ever popular signate ring, the ever loved Spinel is creating a storm in the jewelry market today. Easily mistaken for a Ruby, the ever lustrous Spinel has exceptional hardness that makes it a good imposter. But that should not derail you because the colourful Spinel is, in fact, a gemstone you might want to have in your jewellery box after you’ve read this post. Haven’t we all heard about the famous Black Prince’s Ruby that was, in fact, a Spinel set upon the British, Imperial State Crown. A natural gemstone, it weighed 170 carats it redefined majesty. Resting beside the luminous Cullinan Diamond, the astounding 317.4 carats, the crown is an opulent, royal statement. But, why has uncertainty loomed over these gems in the past? Through this post, you’ll be picking out the right Spinel with ease. Both, the Spinel and the Ruby have exceptional hardness as a result, they have incredible lustre. Key to telling the difference back in the day, lustre spoke multitudes without much gemological advancement. Spinels naturally form in the Cubic Crystal structure, often appearing as sharp crystals or as tumbled stones. This led to its name perhaps originating from the Latin word Spina meaning thorn. Filled with rich colour that will distract the viewer from any other feature, the Spinel instantly transforms any piece of jewellery adding both grandeur and style. With red carpet colours resulting from the alteration of Magnesium and Aluminium, Spinels commonly come in lighter toned reds, purples, violets and even fainter blues. For example, the Reds get their colour because of Low levels of Aluminium which is replaced by Chromium. The cooler toned Blues, on the other hand, get their colour because elements like Iron, Titanium and Zinc replace Magnesium. Intermittently set together with Diamonds and Sapphires, these royal tinted gems pair well together and do not easily abrade each other. With a little gemological knowledge, you’ll be surprised to know how easy it is to distinguish a Spinel from any other gemstone. Presence of fingerprints and crystals are quite common in Spinels. Generally seen as octahedral crystals and euhedral crystals that often look like mystical galaxies in space. With a hardness of 7.5-8 they are a great choice for everyday jewelry. In an article by Vincent Pardieu, a gemmologist at GIA, he documented a rare Spinel macle. 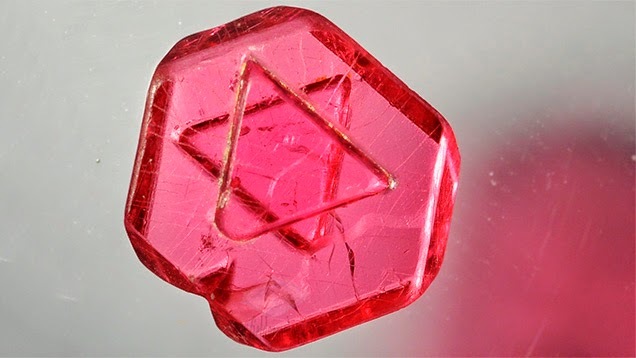 One that formed with a natural marking of the “Star of David“. Unique and rare these Spinels surface reaching markings form when two spinels crystals become one. With all this information of spotting a natural Spinel lets not forget the Timur Ruby. Another “Ruby” that has, without doubt, left everyone questioning. Dating back to the Mughal times, the Timur Ruby or in its true form the Timur Spinel is a ravishing tumbled gem that will steal your heart. Carved with the names of Jahangir and his father Akbar, it once rested upon the Peacock Throne. Looted by Nadir Shah whos name is also inscribed upon the gem after a couple more loots and returns it finally ended in Queen Victoria’s necklace created by the house of Garrard and has been in the private collection ever since. Spinels are the most extravagant red gems you can find. Their pure, rich and royal hues that sparkle brilliantly when cut well will leave you speechless each time. One of my favourite gems, the Red Spinel will have you falling in love with just one look. Pretty nice post. I just happened after your blog and wished to admit My spouse and i have really enjoyed looking your blog posts. Following all I am subscribing to your rss feed and i also hope you write again soon!